The Guardian’s Facebook app is generating almost a million extra page impressions per day, according to figures released by the news outlet and by Facebook. Two months on from its launch at Facebook’s f8 conference in London the app has been installed by over four million users. The news outlet also believes that the app is engaging a younger audience, as over half (56.7 per cent) of the app’s users are 24 and under and 16.7 per cent are 17 and under. The Independent, the other UK-based news outlet to launch a Facebook app following f8 on 22 September, is reporting that it has more than one million monthly active users connecting their Facebook accounts. The integration has bumped up older articles that have gone viral through social distribution, according to the Facebook post detailing the statistics. The news organisation found that many of the “most shared” and “most viewed” stories on the site have been from the late 1990s, “a result of the increased social virality”. 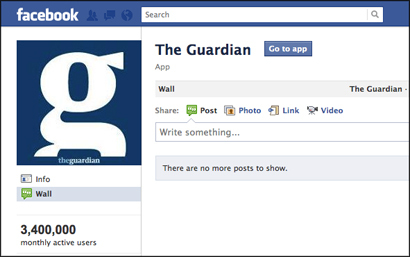 The Guardian and Independent both took a different approach when building their Facebook apps. The Guardian focused on the reading experience within Facebook, the shared reading experience for the Independent takes place on the news site. Yahoo! News, which like the Independent integrated the app into its site, has reported that 10 million people are using the app, with Yahoo! News experiencing a 600 per cent increase in traffic coming from Facebook as a result. People who connect to Facebook on Yahoo! read more articles than the average user, the Facebook post states. Like the Guardian, the Washington Post built a social reader app for Facebook as a companion for its website with the social sharing taking place within Facebook. It has drawn more than 3.5 million monthly active users so far. The Facebook post states that the social reader is growing, especially among international audiences and younger readers, with 83 per cent of readers under 35 years old. 1. Show recommendations to increase engagement. Keep people engaged by prominently showing friends’ recent activity on your main pages and pages with high exit rates. When no social content is available, surface personalised recommendations based on users’ interests on Facebook and clearly explain why you’re showing each recommendation. 2. Create compelling objects. Maximise the click through rates of your stories by specifying Open Graph tags for all your articles and including compelling images, titles and descriptions. Avoid misleading images or titles to prevent your app from being marked as spam, which will negatively impact your app’s distribution in news feed. 3. Leverage your existing user base. If you have an existing site, be sure to make connecting a prominent option for existing users. And if people are already sharing your content on Facebook, consider sending referral traffic from Facebook into a flow that makes it easy for people to have a social experience on your site. 4. Make the benefits of sharing clear. Open Graph apps are designed for people that want to share. In your app, you should clearly explain how your app works and the benefits of adding your app to their timeline. Choose an approach that makes the most sense for your users, whether that’s an informative dialog, in-line marketing messaging, house ad inventory, and/or a learn more page. 5. Keep users in control. As we’ve previously highlighted, people are more active when they are in control. In addition to the privacy controls on Facebook, we encourage you to build controls into your app that fit how people use your app. This entry was posted in Online Journalism, Social media and blogging, Traffic and tagged Facebook, facebook apps, Independent, The Guardian, Washington Post, Yahoo News on November 30, 2011 by Sarah Marshall. Yahoo is testing the water with new features on its news platform which aim to improve the browsing experience of users and offer clear signposting to trending stories and topics, according to a post on the Shaping the Future of the Newspaper blog. The first feature – “Infinite Browse” – provides a visitor with a small window of search results at the bottom of a news story, offering links to other Yahoo News results based on the same topics, in order to keep visitors inside the Yahoo network. It is currently being tested on a small number of visitors to the site. The sfn.com blog also mentions a second “Trending Now” feature to be introduced soon. Yahoo is also bringing trending topics to its Yahoo.com homepage and its network sites that include Yahoo Mail, Yahoo Sports, Yahoo News and Yahoo Finance. The feature, called “Trending Now,” will help users find hot topics of the day and discover related content, according to the Yahoo Blog. This entry was posted in Business, Editors' pick, Handy tools and technology, Online Journalism, Search and tagged linked articles, search features, Shaping the Future of the Newspaper blog, tagging, trending, Yahoo News on August 10, 2010 by Rachel Bartlett. The deputy publisher of the US site TalkingPointsMemo, Andrew Golis, has announced that he will be leaving to launch and run a new blog for Yahoo News. The name is yet to be decided. This entry was posted in Online Journalism, Social media and blogging and tagged andrew golis, talking points memo, Yahoo News on October 22, 2009 by Judith Townend. Politico is set to expand its staff from 85 to a team of 100 following the US presidential elections with a string of editorial appointments. The publisher will also increase its print run to four days when the US Congress is in session. Politico 44 – a new website aimed at expanding coverage of US politics beyond Capitol Hill in Washington – will be launched on November 5. This entry was posted in Editors' pick and tagged politico, U.S. Congress, United States, Washington, Yahoo, Yahoo News on September 23, 2008 by Laura Oliver. US President George W. Bush will give his first online interview later today in a collaboration between political website The Politico and Yahoo News. Bush will be questioned on camera by The Politico’s Mike Allen, who will go behind-the-scenes at the White House and ask questions on a ‘colorful mix of serious policy-related topics, and some personal questions’, a release on the site said. The video will be available on Yahoo News’ homepage from Tuesday afternoon (EDT) with a full transcript on Politico. “This interview is a natural progression in political news coverage, mirroring the change in the habits of Americans, who are increasingly turning online for their news,” said Alan Warms, vice president and general manager of Yahoo News, in the release. This entry was posted in Online Journalism and tagged Alan Warms, George W. Bush, Mike Allen, Politics, President, The Politico, The Politico and Yahoo News, vice president and general manager, Video, W. Bush, White House, Yahoo, Yahoo News, Yahoo US on May 13, 2008 by Laura Oliver.